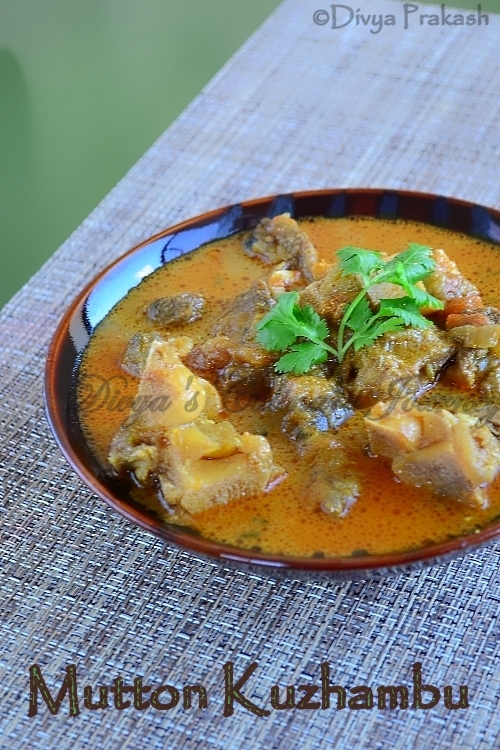 Today's recipe is Mutton Kuzhambu. I made this kuzhambu on Wednesday, clicked the pictures, edited it and even, put an announcement in my FB page but it has taken me 2 days just to sit and finish the post. This time I was not busy with anything, just the laziness that sets in because of the cold weather. We are all non- veg lovers at home, especially my daughter loves mutton. But I make it once in 2 weeks only, that is 2 times a month- it will be mutton Biryani, or mutton fry or this mutton kulambu. Only now it strikes, I haven't tried anything new with mutton. May be will try, test and then post. For now, enjoy this delicious kuzhambu. 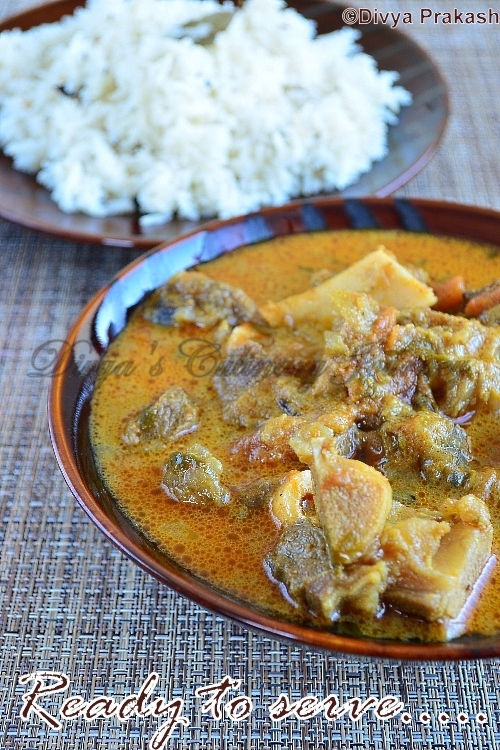 This is a easy to make, South Indian style mutton gravy made using coconut milk. This can be served with idly, dosa for breakfast or pulao for lunch or for roti / chappathi / parotta for dinner. Garam Masala Powder : 1 Teaspoon. Cloves : 3 - 4 nos. 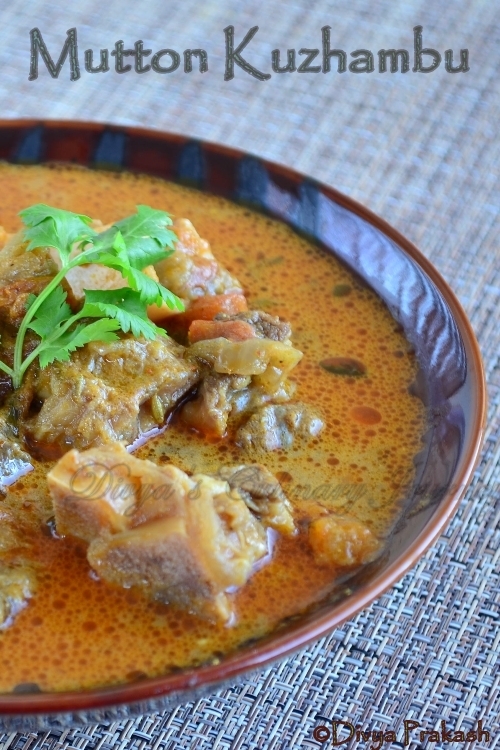 Marinate mutton with the listed ingredients for at least an hour. Heat oil in a pressure cooker, add the fennel seeds, cloves, cinnamon and bay leaf and fry for a minute or two, then add the sliced onions, curry leaves and saute till the onions turn translucent. Add the chopped tomatoes, ginger garlic paste and cook till tomatoes turn mushy. Then add coriander powder, chilli powder and cook for 2-3 minutes. Now add mutton, mix well,if needed add water, close the lid of the cooker and pressure cook till mutton is done. Once the pressure is released, open the pressure cooker, add the coconut milk, check the consistency, adjust the salt and let it simmer in low flame for about 5-6 minutes. Turn off the heat, garnish with chopped cilantro and serve it warm. Adding peppercorns are optional, instead you can add pepper powder. Depending on the meat time taken in pressure cooker varies. If it is mutton it takes about 3-4 whistles while baby goat gets cooked faster. Also the type of pressure cooker too varies. So cook accordingly. Also take care not to over cook the meat. If over cooked, meat becomes tough. mouthwatering :) making me hungry now.. This looks Yum Divya. Made perfectly and clicked too good. Makes me drool, prefect for sunday lunch. gravy looks yummy and delicious.